Leading New Zealand road cyclist Michael Vink notched up a unique double today, adding The Pioneer Mountain Bike Stage Race to the 2018 Tour of Southland title, and hinting that he might not yet be finished on the dirt. Kate McIlroy showed her potential to add another sport to add to her national representation in athletics, triathlon and road cycling, winning the Open Women’s category with Amy Hollamby (Wellington Airport), while in the Mixed Category, former triathlete Josie Wilcox and Joe Skerman (New Zealand) won the final stage to surge ahead of defending champions and local Queenstown riders Mark Williams and Kate Fluker (team New World). Vink and partner Tim Rush (ONYA Bike) dominated the six-day race that took riders throughout the Central Otago region, riding over 400km and climbing over 15,000m, taking on some of the toughest alpine trails and stunning single-track riding that the region has to offer. Vink and Rush took out the final stage into Queenstown today, in the end winning the overall title by a whopping one hour and fifteen minutes and suggested that he and Rush might find other metaphorical and literal mountains to climb on the bikes. “What a week, it has been tough, character building but we have learned so much and have improved throughout the week and that is what we wanted,” said Vink. Category winners earn a guaranteed start at the renowned Cape Epic in South Africa, an event that traditionally sells out in moments, one regarded as the ultimate in mountain bike stage racing and an event that is on Vink’s mind. The celebrations for Rush were made all the sweeter after the disappointment of 2017. Vink and Rush dominated the week, from the moment they took out the prologue at Coronet Peak on Sunday, to the moment they rode into the Gardens today, the ONYA Bike riders won five of the six days after the early demise of the European challengers Vojomag, when Ismael Ventura Sanchez withdrew with illness. Second home today and overall were the well credentialled South Africans, Timothy Hammond and Alan Gordon (team Spot Africa/Insect Science), they finished 17 minutes ahead of defending champions Jimmy Williamson and Scott Lyttle (Willbike/Mortgage Me, New Zealand). The women’s title was very much up in the air heading into the final stage, with Wellington Airport’s Kate McIlroy and Amy Hollamby (New Zealand) holding an eight-minute lead over Brodie Chapman and Briony Mattocks (Shimano, Australia), but the Kiwis held their nerve to win the stage and stamp their name on the trophy. Hollamby was third last year with Haley Van Leeuwen and has ridden and led the team superbly all week and was full of praise for McIlroy. “That was unbelievable, this girl has some pure strength, I can’t believe how she rides, she has had me in the box all week,” said an exhausted but elated Hollamby. Third home was team Madison of Erin Greene and Hannah Miller (New Zealand), Greene was the defending champion from 2017. Closest of all categories was the Mixed, with two-time defending champions Mark Williams and Kate Fluker (New World, New Zealand), unable to defend a six-minute lead on the final day, with the hard charging Josie Wilcox and Joe Skerman (team JoJoe) storming to victory with a nine-minute stage victory into Queenstown. Skerman was his usual understated self as he contemplated putting the bike away for a while to get back to work on the farm. “The tank is well empty now, that was a tough one today. It has been great racing, we have learned a lot. Kate and Willy are awesome riders, we just wanted to keep the pressure on all week and we managed to get it today which we are pretty happy about it. Queenstown local Mark Williams was full of praise for Wilcox and Skerman, despite the disappointment of the untimely puncture. Emphasising the quality of the Kiwis was the third placed team of Jean-Francois Bossler (France) and Fanny Bourdon (CZE), the 2016 Cape Epic winners loving their time in New Zealand. The Masters division was taken out by the Australian SRAM team of Anthony Shippard and David Evans, the pair were dominant throughout the week to win by almost four hours from CyclingTips.com.au Wade Wallace and Allan Iacuone (Australia), with team Nutritec Nathon Wright and Gene Marsh (New Zealand) in third. Equally impressive was team IMB in taking out the Women’s Masters by over three hours, with Kath Kelly and Peg Leyland (Australia) winning the final stage to wrap up a superb week of riding. Second were Emma McCosh and Marquita Gelderman (New Zealand), with Kylie Burrows and Sarah Kaehler (Australia) in third. Burrows was one of the inspiring stories from the event as she returned having undertaken treatment to fight an aggressive breast cancer discovered just weeks after she rode in the 2017 Pioneer. In her own words she was not going to be beaten and returned to compete again in 2018, with a few less ‘free loaders’ on board. The Grand Masters (both riders 50+) was won by Shaun Portegys and Tim O’Leary (2 Old Men, New Zealand), with today’s stage winners Blair Stuthridge and Neil Sutherland (New Zealand) coming home second overall, with Napier pair Kent Wilson and Chris Clark in third on GC. 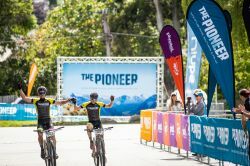 The celebrations at the finish line in the Queenstown Gardens extended well into the afternoon however, with every rider welcomed as a hero as the scope of the accomplishment hit home for many. There were tears, hugs, cheers and smiles aplenty as exhausted riders enjoyed the moment with their team mates, other riders and the many family and friends lining the finish chute at the Ice Arena.